Golden Artists Colors Custom Lab is the only facility of its kind dedicated to designing products to desired specifications for individual artists. The ability to make products to meet artists’ criteria has been a central concern of the Company since its inception. In fact, this was the model that Leonard Bocour and Sam Golden followed in the development of Bocour Artist Colors from the early 1930’s to the late 1970’s. Often artists would visit the Bocour shop in Manhattan to have a particular color or product developed. Artists clearly face obstacles in the limitations of their tools and materials. So often, artists know exactly what results they desire from materials, but find the resources to obtain them unavailable. It was Sam’s vision to maintain a constant dialogue with artists about their specific needs for materials. It has been this conversation with artists, discussing how products work or don’t work, or discussing how to achieve a certain effect, finish, or working property, that has generated the current range of professional products available from GOLDEN. The Company now produces 6 different lines of professional artist paints: Heavy Body Acrylics, Fluid Acrylics, Matte Acrylics, Airbrush Colors, Highload Acrylics, and Glaze Colors. In addition, MSA (Mineral Spirit Acrylic) Colors and a line of PVA (Polyvinyl Acetate) Colors are produced especially for the conservation community. GOLDEN continues to produce two custom lines of colors including Paste Paint and Matte Fluid Acrylics. Added to these colors are over 40 gels, mediums and grounds. Most of these products originate from a simple request by an individual artist to overcome a particular barrier. Over the last 20 years Golden Artist Colors has produced over a thousand custom products to meet the individual needs of our creative customers. Through this unique facility, artists, conservators, designers, architects, manufacturing companies and other clients interested in specialized coatings are able to investigate their extensive creative possibilities. Artists frequently encounter a lack of resources to assist them in overcoming technical obstacles. Because art tends to be such a solitary process, artists will usually try to create their own technical solutions. Many of these solutions are wonderfully accomplished yet typically suffer difficulties. The most endemic problem to artist solutions is that many artists do not have the technical experience to master the intricacies of paint formulation (see Just Paint #7, Just Make Paint). The other problem is not having the equipment, facilities, or materials to produce a reliable paint formula. Although many of these solutions achieve the aesthetic aim of the artist, they often fall short of being archival, reproducible, or safe. GOLDEN’s Custom Lab works diligently to find safer materials without compromising quality. Often artists work in spaces that aren’t commercially ventilated. For this reason it is important to work with the safest materials possible and to provide adequate information when these materials pose a potential health issue. Beginning in 1987, GOLDEN created a separate area of the facility just for custom paint production. By 2000 this facility had grown to over 1000 sq. ft. and includes a staff dedicated to custom processes. GOLDEN has always recognized innovation requires a real commitment of resources. GOLDEN supplies artists trying to innovate their paints with technical support and formulating materials. GOLDEN maintains a very active Technical Support Group led by Mike Townsend, under the leadership of Jim Hayes, GOLDEN’s Technical Director for over 13 years. This support can be essential to artists who are pushing the boundaries of their materials. It has been the passion of Golden Artist Colors to work in association with artists to produce new materials that meet the creative needs of artists exercising the limits of their form. Custom paint formulation allows the artist to concentrate on the painting process and not the materials. GOLDEN has produced custom paints for artists in quantities ranging from less than 1 ounce to as much as several hundreds of gallons. Starting the custom production process is actually quite easy. Initially, the Technical Department will work with the artist or art supply store to see if one of the many products in the GOLDEN product line would suit the particular need. Customer Service will then send out samples or color cards of these products if a potential solution already exists. Usually this sample product allows a clearer discussion with the artist to adjust any or all of the product’s working properties or finish. The Technical Department will also work with the artist to see if the solution can be executed by the artist with some simple additions or combinations of additives, colors or binders. If it is clear to the client that a new product is needed then the Custom Lab Group will develop a potential plan for production and a budget for the custom paint. For some clients this is easy. It amounts to figuring if the time, money and frustration of hand mixing the paint makes sense. Most artists are quite capable of mixing specific hues or blends effortlessly. Increasing the quantities to quarts or gallons can be quite costly however, especially if the artist misses the mark. Blending a gallon of Heavy Body Acrylic Paint evenly for a large project can be very difficult and time consuming, especially without the proper mixing equipment. Often, unless there is an exact formula to follow, one can easily make more paint than is needed creating costly waste. Our facility will make the amount specified. If required, the Custom Lab can provide samples for client approval before scaling up to produce larger sizes. Color matching is the most requested custom service. As with all of the custom products, a dry film and wet lab sample are kept on file in the GOLDEN Archives with the product formula for future reference. GOLDEN offers professional custom color matching in the client’s preferred paint system. Using a spectrophotometer as well as an experienced eye, the expert staff can match colors based on masstone and/or undertone, opacity, sheen, cost and any other factors that influence the needs of the artist. Initially, the client submits a sample of the color to be matched, either in the form of a wet paint, or a dry swatch (brushed out onto paper, fabric, color book, LAB Plot). GOLDEN then matches the color in the preferred paint system. 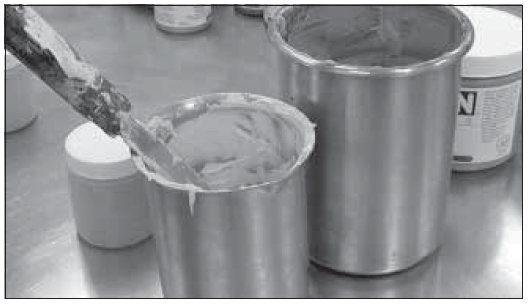 Before scaling the paint up, GOLDEN can submit a dry or wet sample for client approval. Although GOLDEN produces a wide range of different professional products and dozens of unique mediums and gels, there may be certain product needs or properties that are not addressed with our standard products. A specifically designed painting material may be the best choice. Custom products are broken down into several categories: Paints, Mediums, Additives, Grounds and Varnishes. A Custom Paint refers to a pigmented product. Requests in the past have been for varying the level or types of pigment, changing the viscosity (thickness) or rheology (flow or leveling) of the paint, changing the finish or texture of the paint, changing the hardness of the dried product or altering the working properties of the paint. A Custom Medium or Gel Medium refers to any of the nonpigmented products that are used alone or in combination with other paints or mediums. Custom mediums are needed to develop certain attributes such as a change in viscosity or rheology. Changes in sheen, clarity, hardness, shrinkage, adhesion and film build can also be altered to suit a client’s need. Artist’s often seek to change the surface working properties of their paint. One may seek to create more or less absorbency, greater or lesser tooth, levels of opacity or transparency, the slip or resistance to movement of a particular surface. Artists working on various substrates sometimes require a unique material to assure additional adhesion to these substrates. Often the request is for creating a surface to then apply various types of paints or unique applications. These range from artists working in acrylic to artists working in pastels, oils, watercolor, or pencils, to computer created images. Additives tend to be the least understood and most difficult to manipulate as custom products for artists. Additives are those materials that can change the working properties of the acrylic paint but do not offer additional binding capability to the finished film. These products, if overused, can reduce the permanency of the finished film. Additives can assist in altering the way the paint behaves. They can make the product slicker or stay wet longer, reduce or increase foam generation in the paint. They can dramatically change the way the product moves or behaves. GOLDEN has created several custom varnishes that have become part of our product line. These materials are used for bringing together the surface sheen and for protecting the layers of paint underneath. GOLDEN has also created varnishes that are removable from the acrylic surface and provide additional ultraviolet protection. In some instances, artists working in unique conditions require unique varnishes. Potentially harsh chemical environments or environments with high temperature or moisture will require custom varnishes to meet the needs of those conditions. GOLDEN has provided other services beyond custom paint production. The GOLDEN Lab has the ability to do various levels of testing for properties such as lightfastness, adhesion, stability, and application testing. These support services are necessary when an artist is required to work under a condition which is outside the normal performance boundaries of the materials. 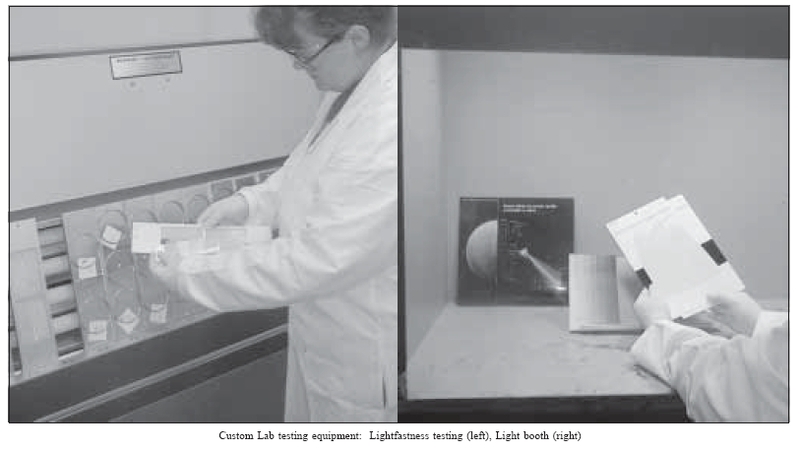 Lightfastness, or the resistance of a material to fade or change when exposed to sunlight, is a key indicator in assessing the archival integrity of an artist material. Fortunately, it is a characteristic which can be tested in a controlled manner and quantified through measurement on a spectrophotometer. As a manufacturer, performing these tests is the most important part of developing and introducing new products. Careful evaluations are made of every pigment and binder we use in manufacturing GOLDEN products. Standard test conditions, including ASTM standards are used as guidelines for sample preparation. This includes factors such as substrate selection, film thickness and pigment concentration. Additionally, we test the products according to how they might be used. However, the reality is that we are constantly presented with examples of the products used in new and innovative ways. Unique combinations, supports, the addition of unique materials and unusual environments can create concern for the permanency of the artwork. For this reason, we offer our clients lightfastness testing, so they can confidently use pretested materials or applications in their work. As these tests can take considerable time, it is necessary to consider your need for lightfastness testing well before the custom product is required for use. Another common cause of failure in an innovative application is the loss of adhesion between the paint film and the substrate. The potential for this failure can be evaluated through testing samples following ASTM standards for adhesion. This will enable the client to make the best possible choices when deciding on surface preparation, primers, transition coatings, etc. GOLDEN can perform tests on prepared samples sent to us, or we can prepare them in our custom facility. 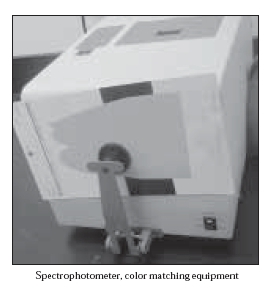 When an artist is working with new substrates, materials, or application methods, there is a concern that the new methods might reduce durability of the finished film. Artists can submit samples of new substrates they are considering. The GOLDEN Custom Lab will test for key issues such as yellowing or fade resistance using the application procedures required by the work. This may require spraying, screening, or various other methods of application. As with lightfastness testing, these procedures often require additional time to assure thoroughness. There are times when an artist requires a product so unusual that standard paints, gels, mediums, or additives and other common products do not meet the specific need. Such products require a great deal of testing and many trial batches to ensure that the product performs adequately, and is archival. With such product development, several rounds of trial batches are formulated, with the client’s suggestions being essential in defining all of the required attributes. Testing to meet requirements may include: UV stability, adhesion, freeze-thaw stability, flexibility, and durability. Creating a new product is a complicated and time-consuming process. It is successful when the artist becomes part of the process of development. Golden Artist Colors has been privileged to participate in the creative process of many artists and companies by providing them with a wide range of custom services that cannot be obtained by any other means. About Golden Artist Colors, Inc.
We would be happy to help! To contact them, please go to our Contact Us page https://www.goldenpaints.com/contact_us and select Custom Lab from the Department List. Or email us your contact info at help@goldenpaints.com, stating that you would like to place a custom order and describing what you would like, in terms of amounts and type of paint (Heavy Body, Fluid, matte, glossy, etc. ), and we will have someone in the Custom lab reach out to you directly.